Due to the popularity of this post, we’ve written a version focusing on failed attach and failed mount errors on Microsoft Azure. For more on how to resolve these errors on AWS, keep reading. This blog is part of a new series on debugging Kubernetes in production. As the leader in running stateful services in production, Portworx has worked with customers running all kinds of apps in production and one of the most common errors we see from customers relates to failed attach and failed mount operations on an AWS EBS volume. These errors results in being unable to mount volumes for pod because volume is already exclusively attached to one node and can’t be attached to another. This post will show you how to resolve Failed AttachVolume and FailedMount warnings in Kubernetes and how to avoid the issue in the future. Warning FailedAttachVolume  Pod 109 Multi-Attach error for volume "pvc-6096fcbf-abc1-11e7-940f-06c399d05922"
IncorrectState: vol-03ea2cb51f21f9fac is not 'available'. Specifically, there are errors for FailedAttachVolume and FailedMount, attach and mount being the two essential tasks for properly starting up a stateful container that uses an EBS volume. When something happens that requires a pod to rescheduled to a different node in the cluster, if the unmount and detach operations are not possible before the host becomes unavailable, you will not be able to attach it to a new host. In our experience, 90% of EBS issues and Kubernetes come down to the this issue. You can’t startup a pod on some EC2 instance because its EBS volume is still attached to some other (potentially broken) host. Let’s simulate the Kubernetes process by doing the operations manually. 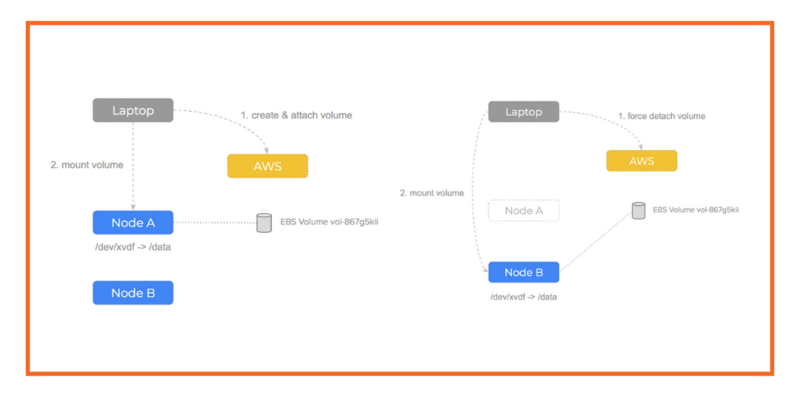 Note that the attach-volume command can be run from any computer (even our laptop) – it’s only an AWS api call. 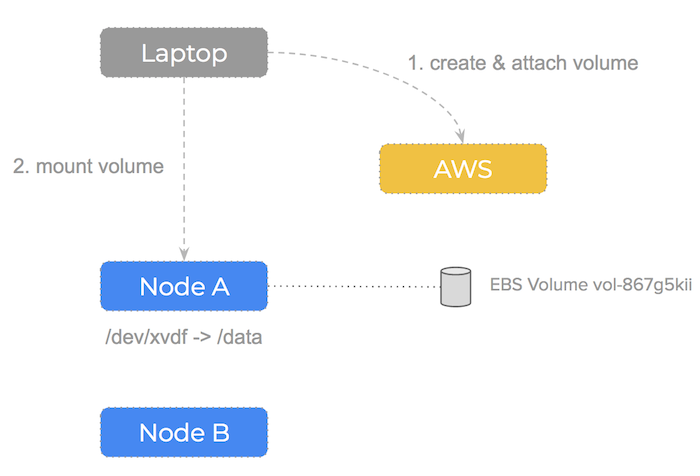 Now that AWS has attached the EBS volume to our node – it will be viewable on that node at /dev/xvdf (or whatever device path we gave in the attach-volume command). Note that the mount command must be run from the node itself. We can then start writing files to /data. Because we have not used this volume before – we have formatted first the drive with an ext3 filesystem. Kubernetes automates a lot of this process – in a previous blog post we showed you how Kubernetes manages persistent storage for your cluster. With that background out of the way, let’s look at some failures that can occur during daily operations. The Warning FailedAttachVolume error occurs when an EBS volume can’t be detached from an instance and thus cannot be attached to another. This happens because Kubernetes will not force detatch EBS volumes from nodes – the EBS volume has to be in the available state to be attached to a new node. In other words – Warning FailedAttachVolume is usually a symptom of the underlying failure to unmount and detach the volume from the failed node. You can see in the Kubernetes codebase that this error is generated when Kubernetes attempts to attach the volume to a node but it is already attached to an existing node. The FailedMount error comes in because since we were unable to attach a EBS volume to the new host, we are also, by definition, unable to mount that volume on the host. You can see in the Kubernetes codebase one of the examples where this error is generated. Let’s take a look at these failure scenarios and see how Kubenetes using EBS copes with them. Networks are one major component of a distributed system that can go wrong and lead to the log messages after failure: Warning FailedAttachVolume and Warning FailedMount. We can simulate a network partition with an $ iptables -A DROP command on one of our nodes. When the network is killed, the kubelet is unable to communicate its status back to the Kubernetes master and is thus dropped from the cluster and all its pods are rescheduled to other hosts. Multi-Attach error for volume "pvc-6096fcbf-abc1-11e7-940f-06c399d05922"
When the Docker daemon crashes or stops, the pods running on the host don’t stop, however, Kubernetes will nevertheless reschedule them to other hosts because the kubelet cannot report the status of those containers. This can be tested by running $ sudo systemctl stop docker on one of the nodes. Multi-Attach error for volume "pvc-6fb2d9ff-b991-11e7-8e89-060bb7549b64"
IncorrectState: vol-07c7135dc55da5c5f is not 'available'. One of the most powerful features of Kubernetes is the ability assign pods to particular nodes. This is typically referred to as affinity. A simple way to implement affinity is with nodeSelector, basically a key-value pair label that describes a node. If you place a nodeSelector in your pod spec, Kubenetes will respect that label when making scheduling decisions. When this affinity setting is updated and your pods are rescheduled to nodes that fit the nodeSelector criteria. This also applies to the cordon command – which makes use of node selectors to render a node un-usable by pods. In both cases – by changing the values, Kubernetes will re-schedule the pod to another node. In our tests – Kubernetes version v1.7.4 suffers from the problems mentioned above. Because it is not able to force detach the volume, it gets stuck and so cannot be attached to the new node. This will move the volume into an available state which will enable Kubernetes to proceed with the attach operation for the newly scheduled node. In the situations described above – neither Kubernetes or AWS can determine that the EBS volume should be forcably detached. It is always better to err on the side of caution after all, when it comes to production disks, force detach sounds scary! 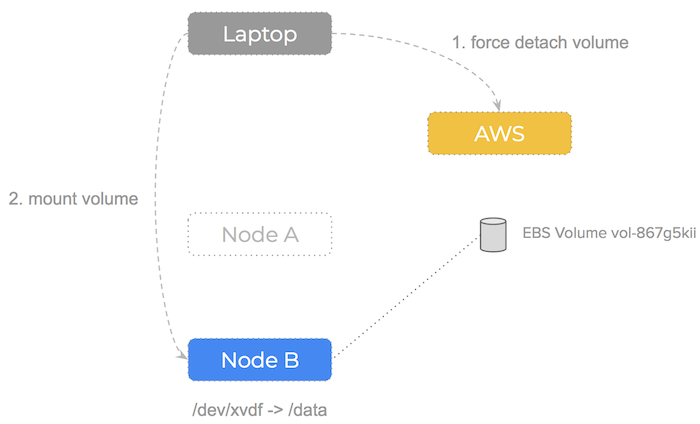 Back to the instance failure test itself, because the node is lost, k8s will reschedule our pods to other nodes the same as above, but because we are simulating the node failure using $ aws ec2 delete-instances, AWS issues what is essentially a force detach. MountVolume.SetUp succeeded for volume "pvc-5cacd749-abce-11e7-8ce1-0614bbc11108"
MountVolume.SetUp succeeded for volume "default-token-xwxx7"
This only works if you have a readiness probe for your pod so that the backend AWS api has a chance to update the state of the volume to available – this test failed when we removed the readiness probe (whereas Portworx passed). There are some failure scenarios above that could possibly be mitigated by updating the Kubernetes EBS driver codebase, however the problem is one of fundamental architecture. The real utility of EBS is that we can have failover without losing data. However, we are losing performance because EBS is network attached. AWS offers EC2 instances that have super fast SSD disks but we cannot use these in our failover scenario. once attached, an EBS volume stays attached and will never be moved to another node. If a node fails – the EBS volume fails with it and should be deleted. This really embraces the immutable infrastructure aspect of a cloud native approach to a system. The question remains – how can we ensure no data loss in the event of failover? The answer lies in the way Portworx takes an entirely different approach in consuming the underlying EBS drives and using synchronous block layer replication. Portworx takes a different approach – it pools the underlying EBS drives into a storage fabric. This means containers get virtual slices of the underlying storage pool on demand. It is able to replicate data to multiple nodes and work alongside the Kubernetes scheduler to ensure containers and data converge efficiently. With Portworx, EBS drives are created, attached, mounted and formatted once and then join the storage pool. Thousands of containers could be started using the same number of EBS drives because Portworx decouples the underlying storage from the container volumes. As you can see – Portworx consumes the underlying storage but decouples the actual drives from the volumes it presents to containers. Because the data is replicated and we are using shared volumes – the failover scenario we saw earlier becomes much simpler (and therefore less error-prone). We can see the advantage of using the Portworx storage layer to decouple our EBS drives from container volumes. We remove an error-prone and brittle process and get out of any stuck EBS problems we were having. Think of Portworx like a gearbox sat between your underlying EBS drives and containers using volumes from that underlying storage pool. Without that de-coupling mechanism, we are back to having a single EBS drive per container and if we are running a large number of stateful containers – increase the risk of encountering the dreaded volumes stuck in the “Attaching” State problem. Hopefully, this post has given you some insight into the cause of the infamous Warning FailedAttachVolume and Warning FailedMount errors in Kubernetes.